Thailand's cabinet held an emergency meeting Sunday after a warning that its long-running standoff with anti-government "Red Shirts" in Bangkok could deteriorate into an "undeclared civil war." Prime Minister Abhisit Vejjajiva said in his weekly television address that the meeting at a military base would focus on rules of engagement for security forces, but sought to reassure the public he had a plan to defuse the crisis. "I have already decided what steps to take, but I need to make sure it will be successful and have the least negative effect as possible," Abhisit said. "I have to make sure that it will be a sustainable solution. It will take time, but there will be effective measures," he added. "After I do all of this, I will announce what I have decided to do about demands for parliament's dissolution." 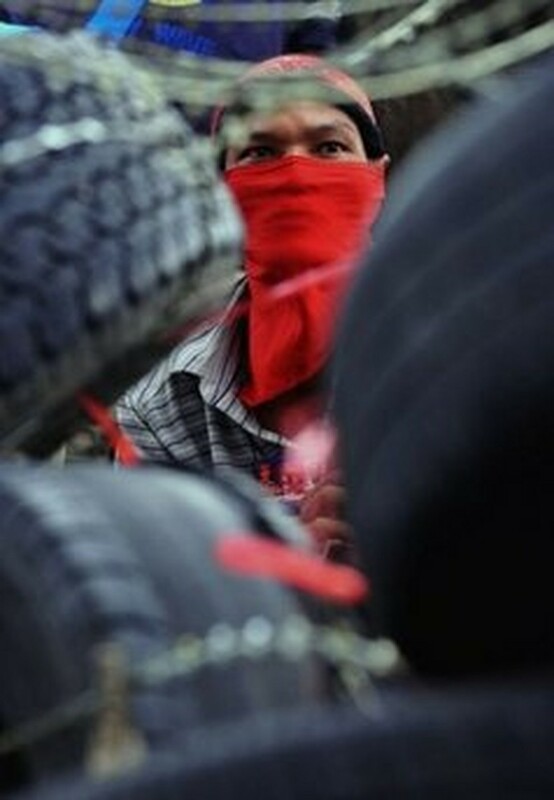 A Thai Red Shirt anti-government protester monitors police movement from a fortyfied camp in the financial central district of Silom in downtown Bangkok on May 2, 2010. The Red Shirts have occupied sections of Bangkok since mid-March in their bid to force snap elections, with 27 people killed and nearly 1,000 injured, in the capital's worst political violence in almost two decades. Amid the simmering tensions, top think-tank the International Crisis Group (ICG) said Thailand must consider mediation from other countries to avoid a slide into further violence, a step which Abhisit rejected. "The Thai political system has broken down and seems incapable of pulling the country back from the brink of widespread conflict," said the ICG in a report released Friday. "The stand-off in the streets of Bangkok between the government and Red Shirt protesters is worsening and could deteriorate into an undeclared civil war," it added. The report suggested forming a neutral negotiation committee with help from international figures such as East Timor President Jose Ramos Horta, a Nobel laureate who recently met Abhisit in Bangkok. "Many countries are confused and ask why there is no negotiation. I talked to the premier of Timor and I listened to his advice that we need two ways to solve the problem," Abhisit said in his television address. "The first is that the government must stop anyone who acts against the law. The second one is the government must not ignore the needs of the people." The demonstrations are the latest chapter in years of turmoil pitting the ruling elite against the Reds, who say the government came to power illegitimately in 2008. Many of the Reds come from Thailand's rural poor and urban working classes and support former prime minister Thaksin Shinawatra, who was ousted in a 2006 coup and now lives overseas to avoid a jail term for corruption. The Reds have faced heavy criticism after about 100 supporters raided Bangkok's Chulalongkorn hospital Thursday evening in the mistaken belief it sheltered security forces preparing a crackdown. The Reds claim the hospital was used in an April 22 grenade attack, during a standoff between pro- and anti-government supporters, that killed one person and wounded dozens. The government said the grenades were fired from inside the Reds' camp -- an accusation the movement has denied. Protest leaders on Saturday slammed management at Chulalongkorn hospital, saying its chaotic evacuation of patients after it was stormed by Red Shirts was a ploy to make the protesters look bad. Abhisit said Sunday that his government had asked authorities to keep the hospital running, even if it sparked violence. "We know that operation brings a risk of clashes and losses but the government knows what we have to," he said. About 70 bomb and grenade attacks have been carried out by unknown parties in Bangkok since the Reds began the street protests in mid-March, according New York-based Human Rights Watch.